Ich bin zurück aus Bali und ich bringe euch direkt etwas ganz Leckeres im Gepäck mit! 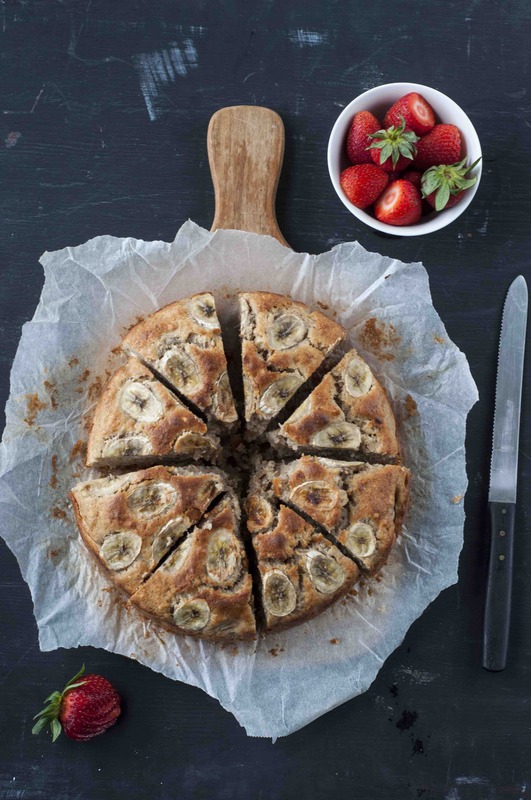 Ja genau ihr habt es richtig erraten – das allerbeste, saftigste, leckerste Bali Banana Bread! Aber lasst mich von vorne anfangen. I’m back from Bali and I brought something really really delicious in my suitcase! 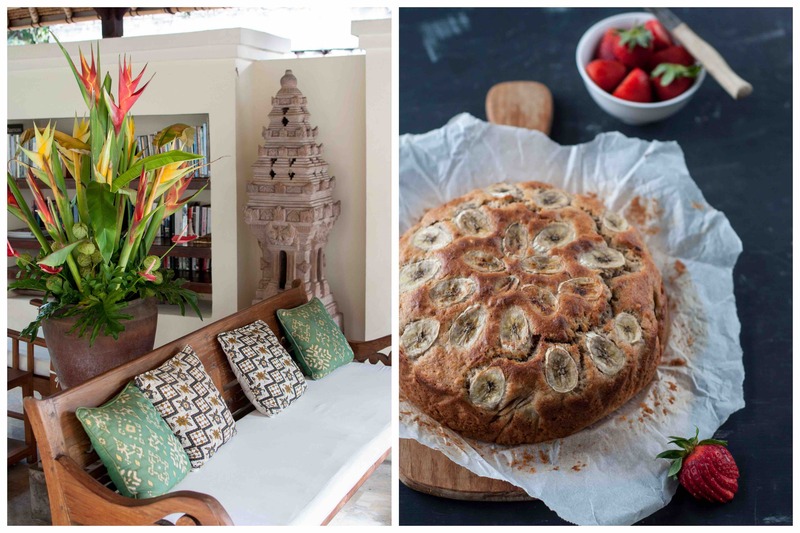 Yes you guessed right – it’s the world’s best, most moist and delicious Bali Banana Bread! But let me start from the beginning. Ich hatte noch nie einen so besonderen Urlaub wie auf Bali. Zuerst waren wir in Seminyak (dazu gibt es auch noch einen extra Food Guide) aber die Geschichte des Banana Breads beginnt in Ubud. Und zwar in unserem tollen Hotel: Komaneka Monkey Forest. To be honest I never experienced such a special holiday like I did in Bali. 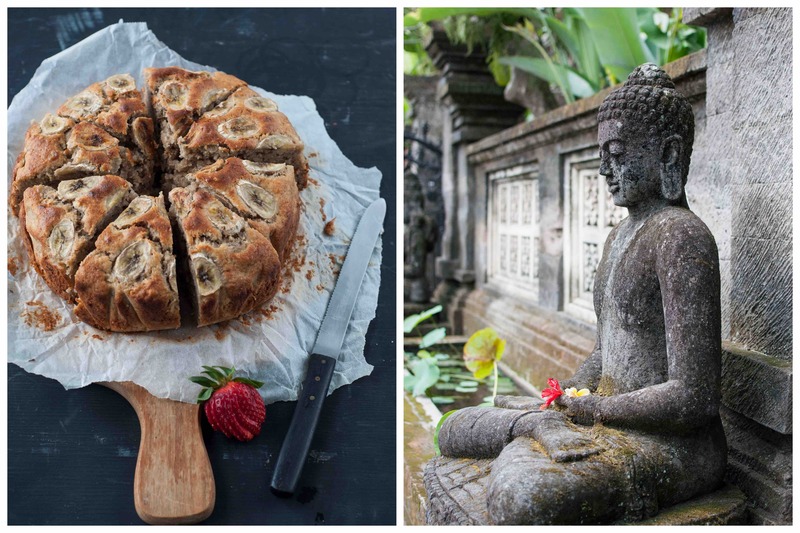 We started in Seminyak (and there is a whole Food Guide coming up) but my banana bread story starts in Ubud. To be more specific: it started at our great hotel Komenaka Monkey Forest. Ich wollte unbedingt in ein Hotel, das gut gelegen ist- denn nach all den nebeligen, kalten Wintermonaten wollte ich so viel wie möglich draussen sein und die Gegend bestmöglich zu Fuss oder mit dem Fahrrad erkunden. Und so sind wir im Komaneka Monkey Forest gelandet. Ubud liegt mitten im im bergigen Landesinneren von Bali. Es ist mittlerweile (und spätestens nach Eat, Pray & Love) touristisch geprägt und ein wahres Mekka der Yogis und Veganer/Health Food Lover geworden. I was looking for a hotel that was situated well – after all that foggy winter days I needed some vitamin D and wanted to explore as much as possible by foot or bike. And that’s how I ended up at the Komenaka Monkey Forest. Ubud is situated in the middle of Bali and especially now (after Eat, Pray & Love) it has touristic character and is the top destination in Bali for Yogis and Health Food Lovers. Aber die Tatsache, dass es touristisch ist, stört einen wenig, denn es herrscht dennoch eine sehr entspannte Atmosphäre- und unser Hotel hat einen grossen Teil dazu beigetragen. Die Philosophie der Komaneka Gruppe ist, dass man als Gast Teil der Familie wird – und das spürt man von Tag 1 an! Jeder kannte unseren Namen, unsere täglichen Pläne und Vorhaben und war sehr aufmerksam. Und so kam es, dass die Mitarbeiter schnell merkten wie sehr ich das Banana Bread liebte. The touristic character didn’t really matter because in Ubud you feel this relaxed and chilled vibe – and our hotel made a big contribution to this fact. Becoming part of the family is one part of Komaneka’s philosophy – and you start feeling that from day 1! Everyone knew our name and our daily plans and was really thoughtful. And that’s how it happened that the employees quickly noted how much I loved the banana bread. Also gab es für mich Banana Bread zum Frühstück, Afternoon Tea und auch noch als Abschieds Care Paket für die Autofahrt! Aber die Mitarbeiter gingen noch einen Schritt weiter und gaben mir netterweise das Rezept, damit ich es mit euch teilen kann! Und ich bin sehr froh darüber, denn es gab nichts besseres als zuhause bei Regenwetter eine Woche nach dem Urlaub dieses geniale warme Banana Bread zu geniessen! And so my days started with banana bread, continued with some delicious banana bread during afternoon tea and they were so thoughtful to pack me some banana bread as a care package when we left the hotel on our last day. But not only that – they were so thoughtful to share their recipe with me so I could share it with my dear readers. And let me tell you – nothing beats eating warm banana bread on a rainy day back at work the week after your vacation! 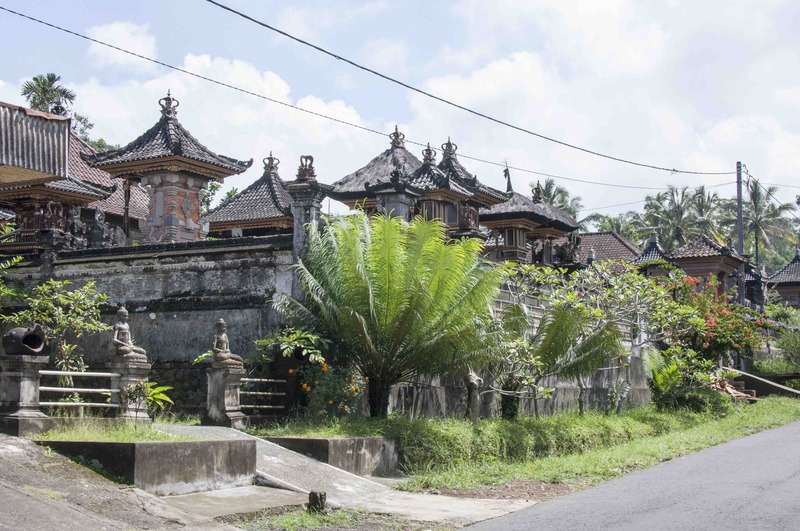 We were really active in Ubud and for me it is a definite Must-Do Thing in Bali. Since we wanted to spend a lot of time outdoors we didn’t get a driver to visit things. We did a Downhill Cycling tour and visited close by villages. Our cool bike guide even took us to a Balinese home, we visited a coffee plantation and had a „cat-poo-cino“ (=Kopi Luwak coffee) and went to so many rice fields and even more flower fields! 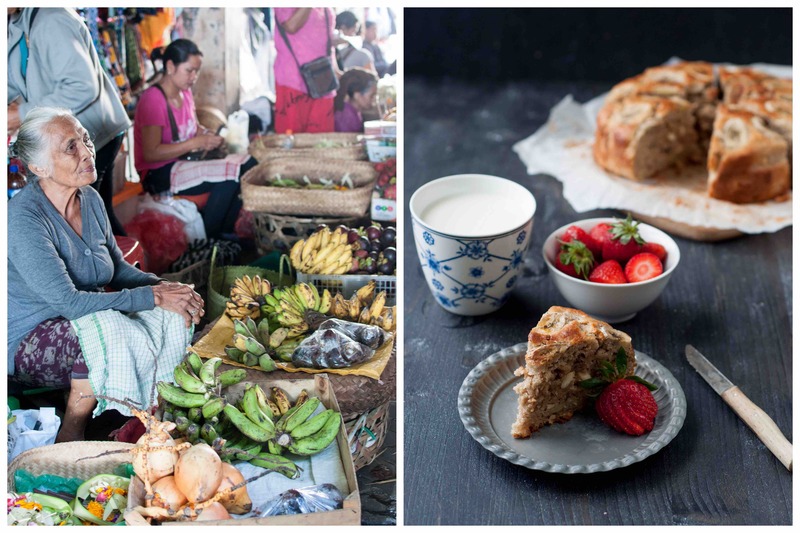 Ebenso haben wir im Rahmen eines Kochkurses den lokalen Markt von Ubud in den frühen Morgenstunden besucht (bevor das ganze Obst, Gemüse, Fleisch und die Blumen gegen touristische Dekorationsartikel getauscht wurden- deswegen unbedingt vor 10 Uhr hingehen!) und haben anschließend bei der fabelhaften Janet De Neefe einen Kochkurs gemacht. Dort haben wir traditionelles balinesisches Essen kochen und geniessen gelernt! Vor allem für Foodies ist dieser Kurs ein definitiver Muss! 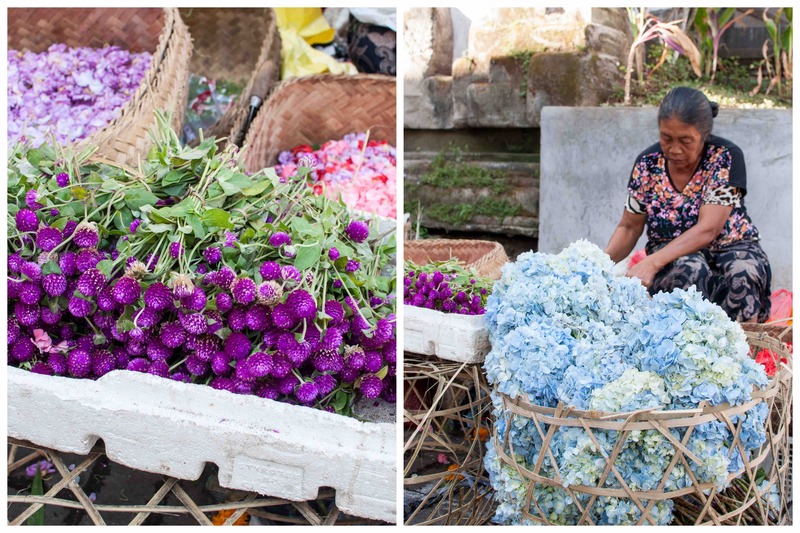 During our stay in Ubud we visited the local market in the early morning hours (they swap all the gorgeous food, flowers, fruits for touristic souvenirs – you should go before 10am!) which was part of our cooking class with the oh so wonderful Janet De Neefe. 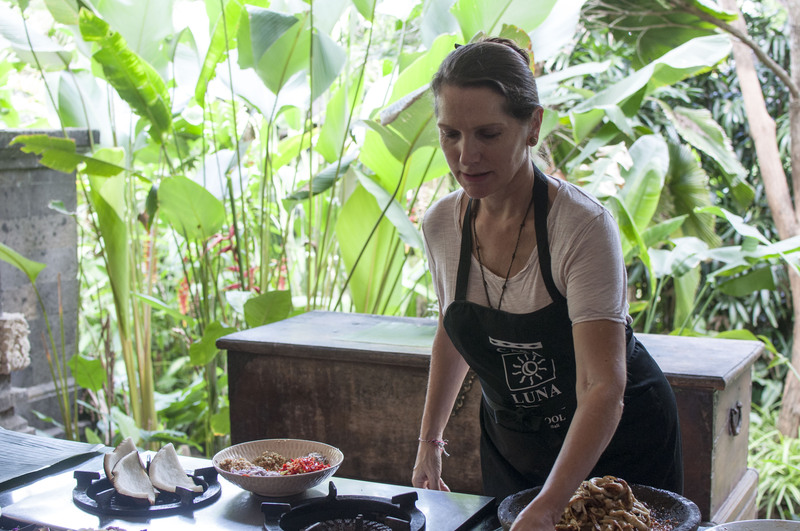 She showed us how to prepare and enjoy traditional Balinese food. 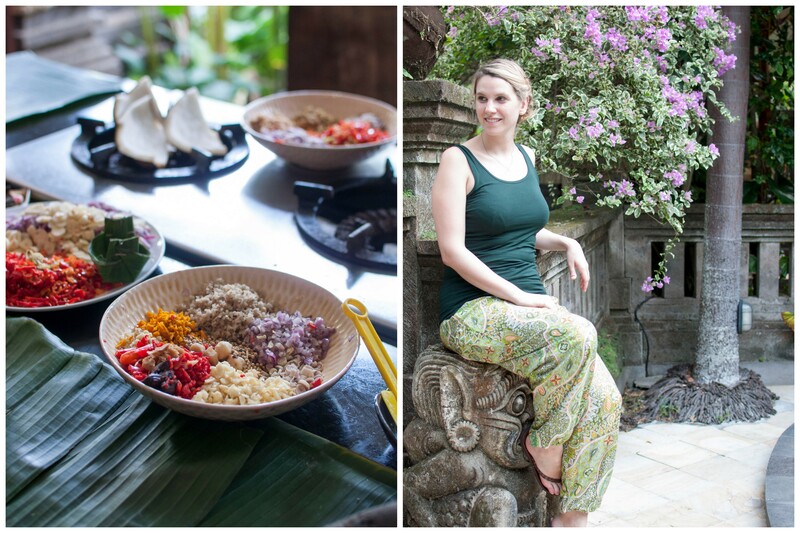 This class is definitively a Must Do for Foodies in Ubud! Wer nach all dem balinesisches Essen ein schlechtes Gewissen hat, hat es nicht weit bis zur nächsten Yoga Schule, wo er all seine Kalorien wieder verbrennen kann! Wir waren in der Yoga Barn und haben unseren Ubud Besuch mit einem tollen Vinyasa Kurs beendet. Eigentlich wäre ich viel lieber jeden Tag zum Yoga gegangen, aber unsere Zeit in Ubud war leider viel zu kurz. The good thing about Ubud – if you feel guilty after eating all that balinese food – the next Yoga Center is so close and you can go and burn your calories! We finished our stay in Ubud with a Vinyasa Class at Yoga Barn. I wish we had time to do yoga every day but our stay in Ubud was for sure to short! Alle, die sich nach dem Essen nicht so voll fühlen, kommen in Ubud auch auf ihre Wellness Kosten. Denn Massieren kann man in Ubud richtig gut und wir können das Tamarind Spa von Murni’s Warung nur wärmstens empfehlen! Jeder, der Massagen mag und auch keine Scheu vor etwas festerem Druck beim Massieren hat, sollte sich eine 120 minütige Balinesische Massage gönnen! 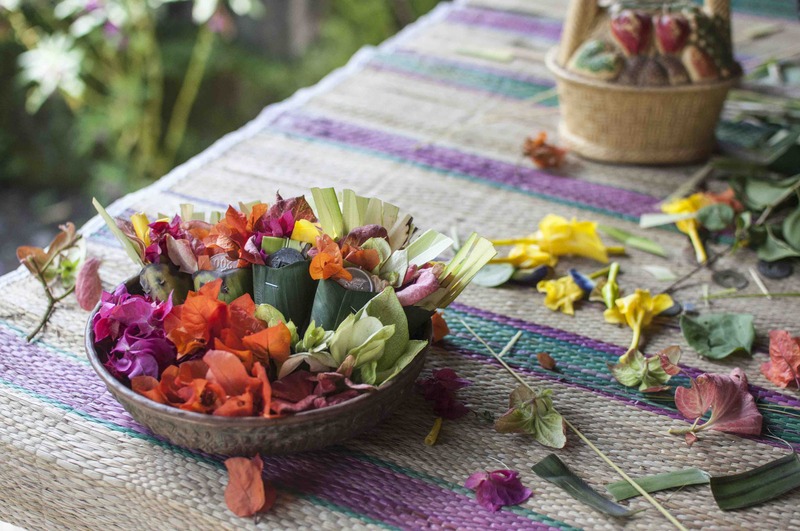 Everyone else, who doesn’t feel guilty after food, can find pretty good wellness offers in Ubud instead of Yoga. We can only recommend the Tamarind Spa at Murni’s Warung. Everyone who loves a little more pressure during massages should book a 120 minute balinese massage! So genug von Essen und Wellness, wir haben Ubud nicht nur von Land, sondern auch vom Wasser aus erkundet. Denn in der Nähe von Ubud fliesst der Ayung River und ist einer von Bali’s längsten Flüssen. Und genau dort waren wir 2 Stunden lang raften! Gott sei dank war ein Tour Guide dabei, denn der Fluss hat deutlich mehr Felsen als die Flüsse in der Schweiz, auf denen ich alleine raften war! Es ist wirklich ein gigantisches Erlebnis das Landesinnere vom Wasser aus zu sehen – die ganzen Wasserfälle und vor allem die Flora und Fauna sind überwältigend! 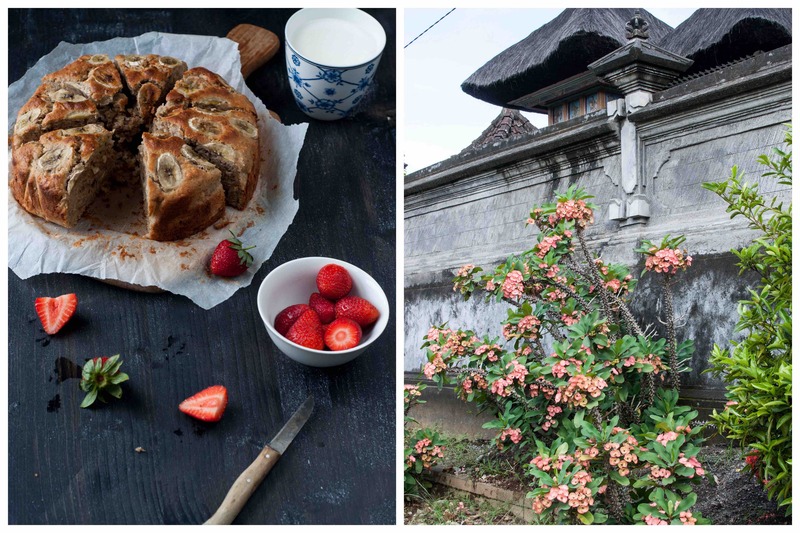 Enough with all that food and wellness talk – we did not only discover Ubud by land. We even took a trip to the water – to be more precise: One of Bali’s longest rivers, the Ayung River, is close to Ubud and yes – we took a 2 hour rafting tour! And oh boy, was I happy to have a tour guide with me since there were some pretty big rocks in that river! But it was such a great experience to see all those great plants, waterfalls and the jungle itself while sitting in a boat! 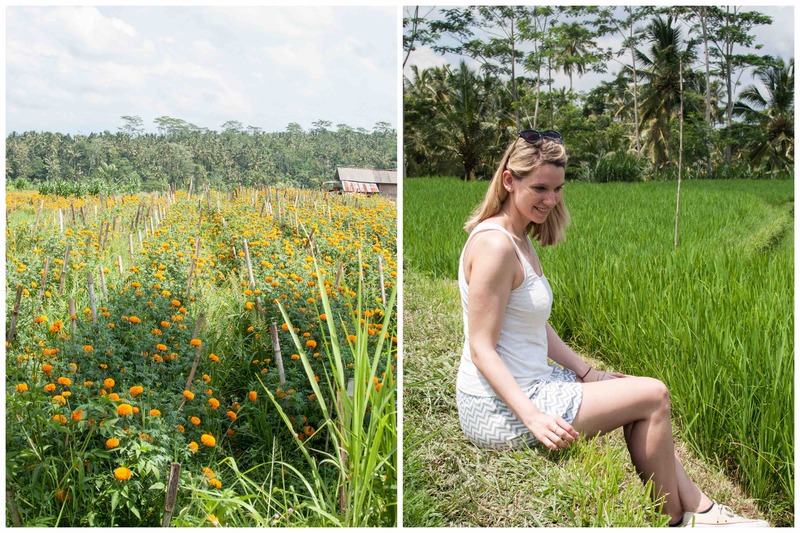 What else is there to do in Ubud? They have monkeys! 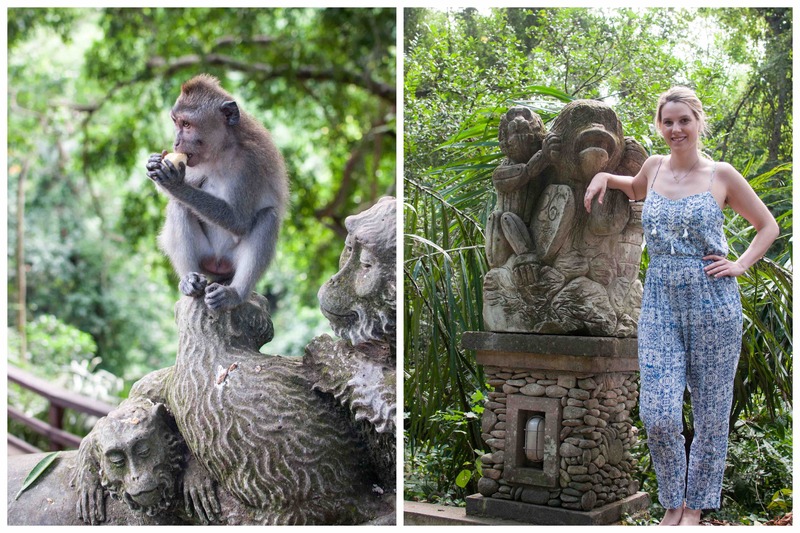 In Ubud’s famous monkey forest you can find a lot of monkey waiting for you to be fed! I met one right away, when he jumped on my to get a taste of my mosquito spray (which I was applying on my arms). But don’t be scared – there are also nice monkey (or let’s say better trained ones) close to the park guards and they are happy to show you how to feed them and what to do or don’t do. Alles in allem war Ubud fast meine liebste Destination, vor allem da ich auch noch Franzi von Have a Try mit der ich letztes Jahr in New York war, zufällig getroffen habe. Ich sage es euch- die Welt ist einfach viel zu klein! Falls ihr einen Bali Trip in Zukunft plant, solltet ihr definitiv ein paar Tage in Ubud einplanen um euch einfach von der entspannten Stimmung treiben zu lassen und so viel wie möglich von der Natur auf euch wirken zu lassen ! I think – at the end of the day – Ubud was one of my most favorite destinations. Especially since I also met Franziska from Have a try. We traveled to New York together last year and she was incidentally in Ubud. I’m telling you – the world is too small! 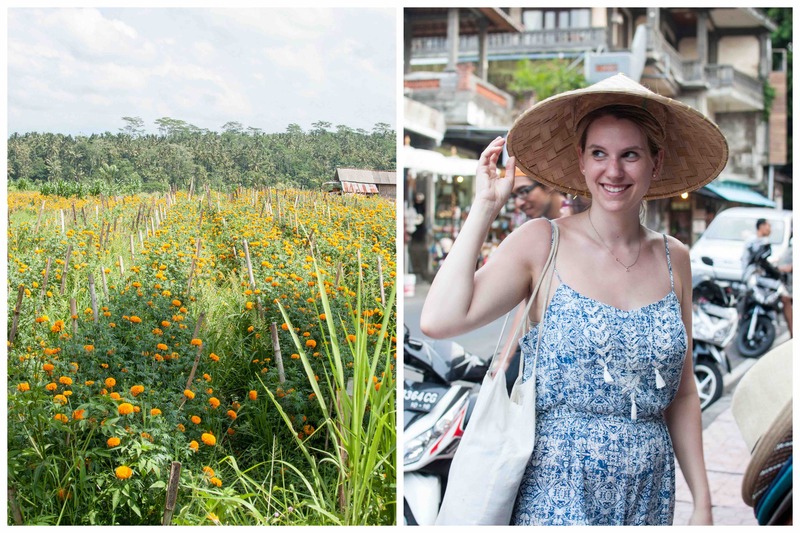 If you plan a Bali trip in the future, Ubud is definitively a Must See and Do! Kommen wir nun zum wichtigsten Teil dieses Posts – das Banana Bread! Für alle Banana Bread Liebhaber ein Muss und definitiv mein liebstes geworden! Ich bedanke mich sehr beim Team vom Komaneka Monkey Forest und vermisse das Banana Bread und meine täglichen Schwätzchen mit Ayu Ulan and Dek Gun. Ubud, I will be back! 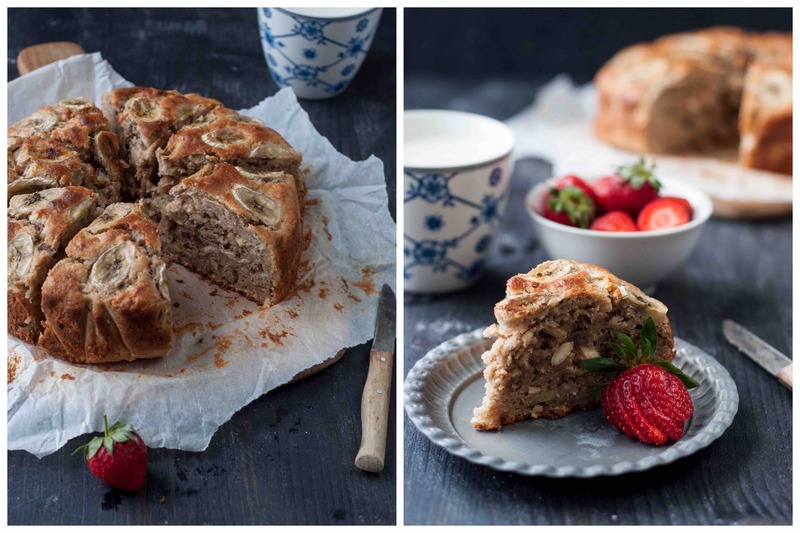 But again, let’s get back to the most important part of this blog post – the banana bread. A Must Bake for all Banana Bread Lovers and definitely my most favorite Banana bread recipe so far. Dear Komaneka Monkey Forest Team – thank you so much for having us, serving us this delicious cake and I already miss the cake and all my nice chats with Ayu Ulan and Dek gun! Ubud, I will be back! Ofen auf 180°C vorheizen und eine Kuchenform fetten. - Preheat oven to 350°F and prepare baking pan. Cashews grob haben und mit Mehl, Zucker, Backpulver, Natron, Salz und Zimt vermengen. - Chop cashews coarsly and combine with flour, sugar, baking powder, baking soda, salt and cinnamon. Eier leicht verquirlen und geschmolzene Butter hinzugeben. Darin die zerdrücken Bananen und das Vanille Extrakt einrühren. Nun diese Masse dem Mehl unterheben und alles gut vermengen. In die Backform geben und nach Belieben mit Bananen Scheiben dekorieren. Für ca. 30 - 35 Minuten backen. - Whisk eggs and combine with melted butter. Add mashed bananas and vanilla and combine. Fold under the flour mixture and mix until everything is combined. Pour into baking pan and decorate with banana slices as desired. Bake for 30 - 35 minutes until golden brown.